For the last six years, I have been in a battle that has life-and-death implications for many who face it. Post-Traumatic Stress (PTS) is no joke. Currently, twenty-two veterans are taking their lives each day. About 70% of those committing suicide today are Vietnam Era Veterans, as they are losing their support networks. Those they have relied on (parents, wives, friends, etc.) are passing away, and in their absence they call it quits. The fact that Iraq and Afghanistan Veterans are committing nearly 30% of veteran suicides is startling. Unfortunately, one day, there will be an absolute epidemic of veteran suicide with Warriors of my generation. Research shows that treating trauma early is essential for long term health, so if we want to make a difference we must act now. It is a moral imperative. There is no greater advocate for peace than one who has been to war, and there are few people who are more selfless than our veterans. We need them in our society, but those who fought on the battlefield are becoming an endangered species. As the VA struggles to figure out which way is up, most returning Warriors have given up on the system. Every single time I speak with a Veteran who has PTS about the VA, they tell me about how inadequate the treatment and service is. Only 16% of Veterans who seek treatment at the VA for PTS claim that the VA’s treatment methods are working. Since the VA focuses on using anti-depressants, this shouldn’t come as a surprise. Not all Warriors who have PTS are depressed. A lesser supply of serotonin is not the core issue, so using SSRI (Selective Serotonin Reuptake Inhibitor) medications to make the release of serotonin more efficient isn’t going to help most Veterans. Fortunately, one Veteran-led organization understands the battle our Warriors are facing and they’re doing something about it. 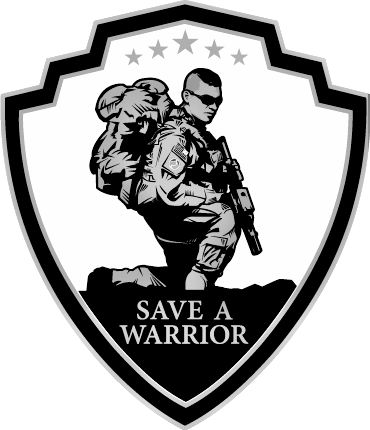 Save A Warrior in Malibu, California is led by Army Veteran Jake Clark. They host free five-day ‘war-detox’ programs for returning Warriors who are suffering from PTS. The program combines evidence-based healing methods with education and powerful learning experiences to offer Veterans the tools they need to recover. Recently, I was afforded the opportunity to attend the program and it changed my life. It was, without a doubt, the most powerful experience of my life. I learned more in those five days about my struggles and PTS than I have in the previous six years combined. Before going to Save A Warrior, I had tried everything. In 2009, I tried every medication that the VA could throw at me, which resulted in my situation becoming much worse. Also, for years I have tried numerous kinds of therapy, to include Cognitive Behavioral Therapy and Eye Movement Desensitization Reprocessing Therapy (EMDR). While both of those types of therapy have been beneficial for me, I knew that something was still missing, although I didn’t know what it was. While at the program, Warriors learn from Save A Warrior’s Head of Trauma Processing and Healing, Dr. Michael Salonius, who teaches them about the evolutionary biology of the brain, the benefits of meditation, and how to teach Warrior Meditation to others. So others can begin to understand the necessity of this work, I’m going to highlight some of the key parts of what we learned on this journey. Perhaps the key to understanding PTS is to first understand the evolutionary biology of the brain and how today’s world puts us at a bit of a disadvantage when it comes to fighting PTS. For thousands of years, humans have operated in tribes, where they hunted for food. The advent of agriculture is still relatively new, as that occurred just about 12,000 years ago, whereas the earliest anatomically modern humans can be traced back about 200,000 years. Before we became farmers, humans operated in close-knit communities where they hunted in groups. We were long-distance runners, relying on our advantage to sweat and regulate heat to run down prey that could not do the same. It should not come as a surprise that studies have shown that running can have similar benefits that SSRI medications do for people suffering from depression, in addition to the obvious physical benefits. Since most people do not get the exercise we need, we miss out. Also, historically, humans have benefitted from having plenty of free time or having roles that allowed them to have room for mental rest, whereas today our minds are constantly engaged in one all-consuming task or another. Throughout history, humans have engaged in mental rest that we now refer to as meditation, and our minds and bodies benefit from it, especially if we have a history of trauma. To understand why meditation works, we must discuss which parts of our brain are implicated in PTS. Our limbic system has a few parts that change when we are affected by trauma, including the amygdala and hippocampus. The amygdala is the “General” of the brain, and one of its primary roles is to ensure that you are prepared to respond to threats. The “fight or flight” function of our brains is rooted in the amygdala, which developed to respond to threats such as lions, tigers, and bears. Historically, we have not been apex predators. Rather, we have been prey, and our brains developed to ensure we could survive when confronted with threats. Our central nervous system believes we are prey, because until very recently in our ancient history, we have been. The amygdala also controls functions such as your heartbeat and your lung function. It is always working, even when you are sleeping. When our Warriors experience multiple traumatic events and long-term exposure to threats, the amygdala becomes sensitive and it changes. The average person has an amygdala the size of an almond, whereas someone with PTS might have an amygdala the size of a golf ball or even a tennis ball. After it becomes used to responding to threats regularly, it doesn’t just return to its normal state. It remains convinced of constant threats, and it begins responding to anything that it may perceive as a threat. When the amygdala engages the “fight or flight” function, it sends a signal to the hippocampus, which releases chemicals to our body so that we can respond to the threat. However, the hippocampus can’t release chemicals and store memory at the same time, which is why many of us have difficulty remembering things. For those of us who know what its like to experience anxiety or panic attacks, the chemical release that comes from being “triggered” is what gives us those horrible feelings that come when we experience anxiety. Also, the hyper-vigilance that we experience is rooted in the changes of the amygdala, which is one reason those of us with PTS experience difficulty sleeping. We are always on guard. Our amygdalas believe that we are always in danger, even if rationally we know that we are not. Our rational thinking is done in the front portion of our brain, which is the prefrontal cortex. The ventromedial prefrontal cortex is implicated in the processing of risk and fear, and it plays a role in the inhibition of emotional responses and in the decision-making process. As those of us with PTS start to feel anxious in certain situations (in the car, at a baseball game, in a crowd, etc. ), our ventromedial prefrontal cortex says “Hey, its okay. I am safe. I’m just at a baseball game or in the car.” At the same time, our amygdala is screaming, “This is not safe! Danger!” To use Dr. Salonius's analogy, we are like a Lamborghini with the gas pedal floored and the brake on. The amygdala is the gas pedal and the ventromedial prefrontal cortex is the brake. Unfortunately, the amygdala’s sensitivity often overrides that rational part of our brain, and the result is sheer panic when the brake comes off. The last essential part of the brain to understand with PTS and the benefits of meditation is the anterior cingulate, which serves as the “highway” between the prefrontal cortex and the amygdala. A good connection between the prefrontal cortex and the amygdala can help transmit a message of safety to the amygdala when we are exposed to stressors. However, when we are rushed, the anterior cingulate shuts down. So, if you notice you have more anxiety and panic attacks when you are feeling rushed or overwhelmed (I know I do), make sure that you cultivate peace in your life by slowing down. The trick in overcoming PTS is to help the amygdala return to a more normal state by helping it realize that we are safe again. Meditation can help do this by increasing the connectivity of the rational part of our brain to the amygdala, and studies have shown that meditation can decrease activation of the amygdala and even shrink it. At the same time that the connection between the amygdala and the rest of the brain becomes weaker, the connections with the prefrontal cortex become stronger. In effect, by meditating we are healing the damage caused by the trauma of war. If you want to really understand how meditation and spiritual practices can have a positive impact on the brain, read "How God Changes Your Brain," in which a team of leading Neuroscientists discuss the findings of their research. At Save A Warrior, we are trained to practice and train others in Warrior Meditation which has three distinct phases: nullification, awareness, and insight. While I won’t share the details of that process here, the method is designed to train the prefrontal cortex by separating sensations and feelings from our awareness of self. Over time, we begin to feel better as the amygdala shrinks and we become less vigilant. Studies have proven that in as little as eight weeks of practicing meditation, we can begin to change the way our brains function and experience healing effects (see How God Changes Your Brain). Aside from learning the science behind what ails us and how to fix it, Save A Warrior also orchestrates a beautifully designed experiential healing process that includes a ropes courses, equine therapy, and rock climbing. Over the next several days, I will post my reflection on those experiences as well. Author: Adam Magers is an Iraq Veteran whose own experience with PTSD encouraged him to take action to help other veterans who are struggling. He has a Master of Global Studies Degree in the cognate fields of International Relations and Comparative Politics and serves as the Director of The Warriors' Hope Project. Legal Disclaimer: The information provided on this site and in this article is intended for inspirational and educational purposes only and is not a substitute for professional medical advice or treatment for specific medical conditions. You should not use this information to diagnose or treat a health problem or disease without consulting with a qualified healthcare provider. Please consult your healthcare provider with any questions or concerns you may have regarding your condition.